Learn how to find hundreds of free and reliable data sets through the Resource Watch platform. Curated by WRI’s experts, Resource Watch features the world’s best data and maps on the state of the planet’s resources, commerce and people all in one place. 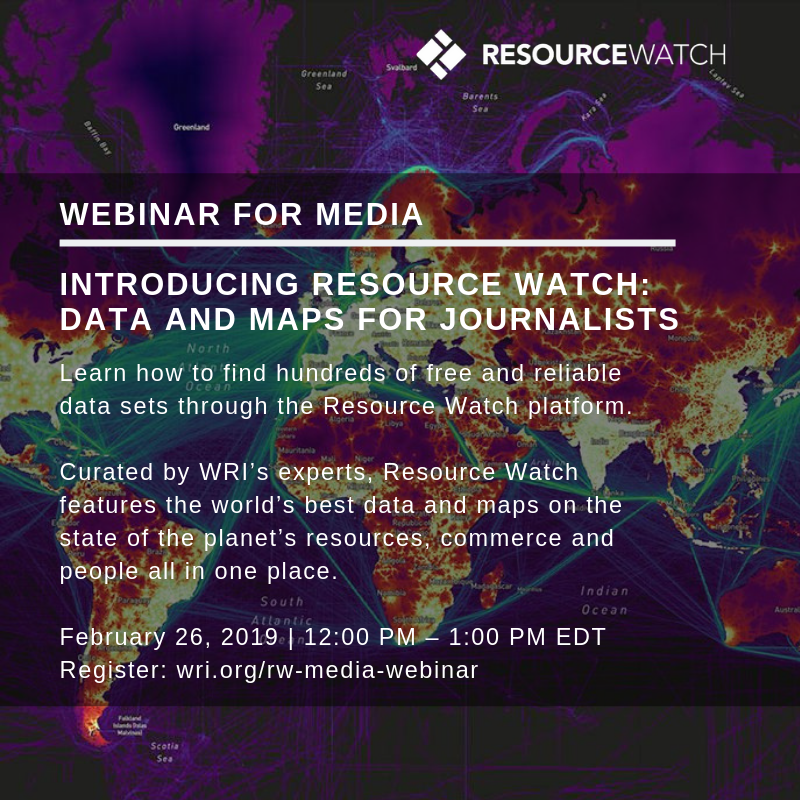 To tackle the problem of too much [bad] data and too little time, the experts at World Resources Institute created Resource Watch, a place for journalists to easily gather reliable data, track natural disasters as they’re unfolding, get analytical help from WRI experts, and tell the kinds of powerful, data-driven stories that resonate with readers and decision makers. Join our first training for journalists on February 26, 2019 - space is limited! On Resource Watch, you can find the world’s best data and maps on population, crops, droughts, fires and other natural disasters, oil spills, air quality, poverty, coastal flooding, power plants, human migration, deforestation, coral reef bleaching, and much more – and overlay them to see interconnections between the issues. We also publish data-driven blogs and do new analysis using the platform each week. We will also give embargoed access to new, unpublished analysis from WRI on the webinar.